The next time a business professor in Thailand is looking for an ethics case study, he might look no further than the mirror. 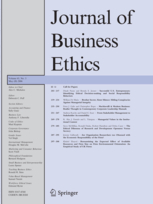 The Editors and publisher regret to report that the paper published by Mohammad Asif Salam as ‘‘Corporate social responsibility in purchasing and supply chain’’ in the Journal of Business Ethics (2009), 85:355–370 is nearly identical to that published earlier by Mohammad Asif Salam as ‘‘Social responsibility in purchasing: the case of Thailand’’ in the International Journal of Procurement Management (2007), 1:97–116. This is a serious violation of publication ethics which according to the Springer Policy on Publishing Integrity warrants a retraction notice to be published in the journal and a ban from publishing ‘‘in any of the journal’s publications for an initial period of 5 years’’. Michalos, editor of the journal, was quoting accurately from the Springer policy. We’ve seen a number of duplication retractions from Springer, but none that have mentioned a ban. Perhaps those other authors also earned one, but it just wasn’t included in the notice. The paper has been cited nine times, according to Thomson Scientific’s Web of Knowledge, while the International Journal of Procurement Management version has yet to be cited. We’ve tried to reach Asif Salam — who earned a spot in Bangkok’s Assumption University’s Hall of Fame in 2004 — for comment, and will update with anything we learn. It’s amazing that you guys at RW are so on top of things to catch this retraction. It has, so far, escaped the attention it deserves among management scholars. I believe that this in part reflects journals’ lack of appropriate software to track potential contributions. A number of management journals have now adopted this software to prevent such errors – although the Lichtenthaler and Frey work probably wouldn’t have been caught with it. Many journals (such as AMJ) require a statement about what other papers have been or are in progress from the dataset. Nevertheless, the various action editors and reviewers should also due their diligence. Scary that 25% and 13% of management submissions (to the major conference in the field) show some or significant plagiarism! John L. Campbell, 2007, “Why Would Corporations Behave in Socially Responsible Ways? An Institutional Theory of Corporate Social Responsibility,” Academy of Management Review 2007, 32(3), 946–967.